This is incredible. See below – excerpts from the interview with Adrian Delia, published in The Sunday Times today. You can read the full interview here. He’s going to sell his businesses and use the money to sustain his lifestyle, Delia says. And this when the shares in his various companies, as published in his own statement of affairs, have put his total share value in all those businesses at just €45,000 – enough to cover one year of annual bank interest on his personal loans. When his interviewer asks him why he has no money or savings, Delia says it’s because he has invested all his money in property. 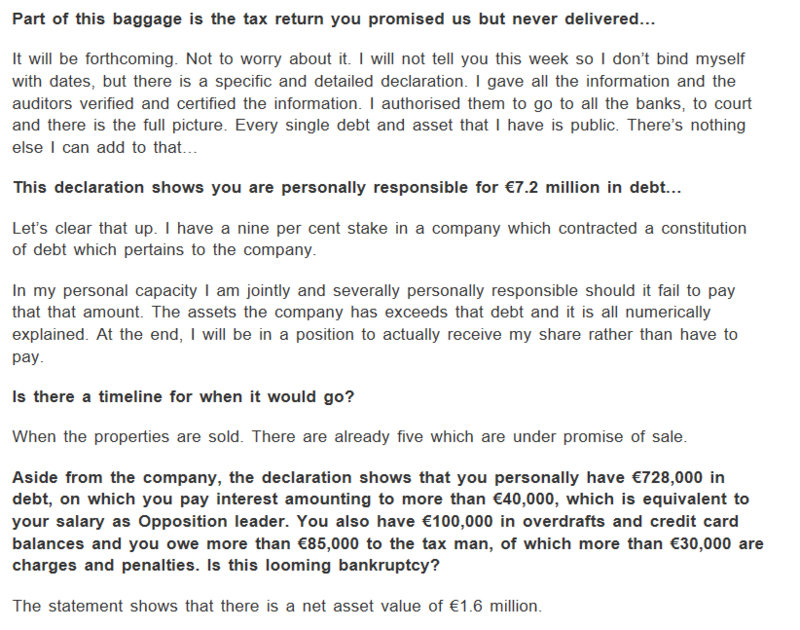 Unfortunately the interviewer was not quick enough to respond that no, he has not, because he owes €728,000 (three quarters of a million) to the banks on his property, which he bought with loans that remain outstanding, and on which the annual interest is more than the Opposition leader’s salary. And when the interviewer correctly asked him about the dangerous situation in which a man with a financially dependent wife and five children has no savings or financial fall-back, Delia suddenly introduced health insurance policies and life insurance into the equation. Really? A life insurance policy is an asset, and should have been included in his ‘professionally audited’ statement of affairs, but it was not. You can use life insurance policies as security for bank loans (the bank will seize the policy and replace the beneficiary if you default) – that’s how much of a tangible asset they are. 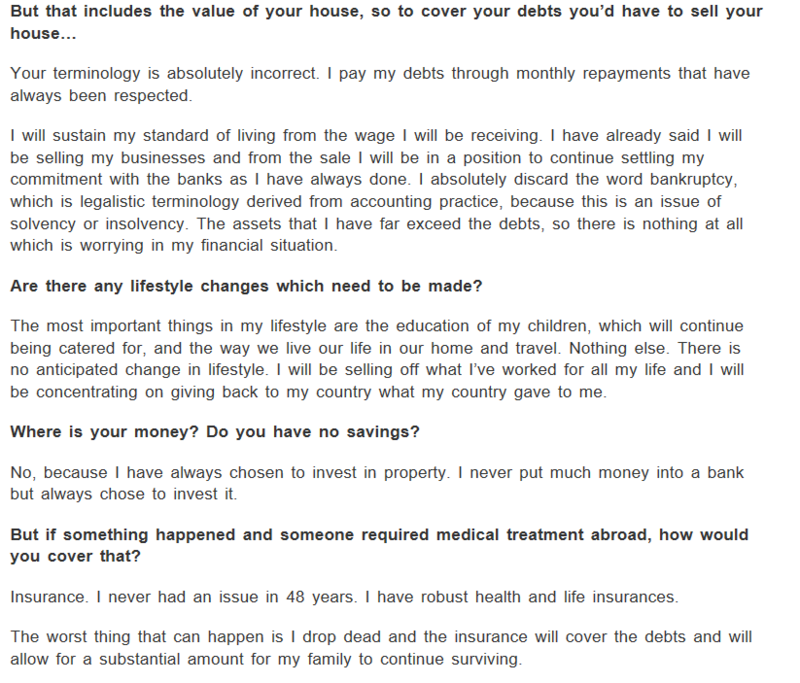 Keith Schembri does: the published accounts of his Kasco outfit show that his bank loans are partly secured against his personal life insurance policies. Delia’s sudden claim that he has life insurance policies and health insurance policies is not reassuring but rather the opposite. It adds another massive stream of outgoings over and above his school bills, annual bank interest and huge cost of maintaining a wife, himself and five children in the extravagant manner to which they have become accustomed. Do people out there actually know the cost of an annual premium on health insurance for seven people, five of whom are children? Do they know the cost of monthly payments towards a life insurance policy that is sufficient to financially support a woman and five children for the foreseeable future should the heroic breadwinner suddenly drop dead? I think not, because ordinary people – the sort who Delia thinks of as “the simple Maltese” – have never encountered the concept of private health insurance in their lives, let alone life insurance. They have no idea of the spending required there. And see below: Delia has told us that he has no intention of changing his lifestyle in terms of home, travel and school bills. This exposes Malta to a very dangerous situation.